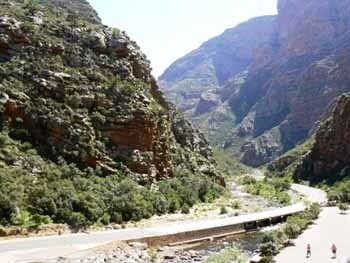 During holiday seasons thousands of tourists (local and international) pass through the town, known for its Karoo hospitality and singular character, and admire the spectacular geological rock formations of Meiringspoort. The world-famous geranium plant (Pelargonium Zonale) originally came from this area. Hendrik Oldenland started collecting wild geranium here as far back as 1689. Within a decade or two seeds and cuttings were exported to Europe. Even today it is still acknowledged as one of the important parents of the massive geranium industry in Europe and America. In early Spring the veld comes alive in a breathtaking display as the wide array of veld flowers start to blossom as far as the eye can see. 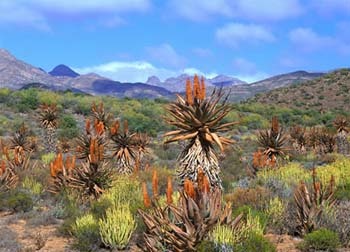 Meiringspoort not only has an incredible botanical diversity but it is also rich in bird life, with plenty of safe hiking trails and an array of animals - from the tiny Cape Spiny mouse to the elusive Cape mountain leopard. 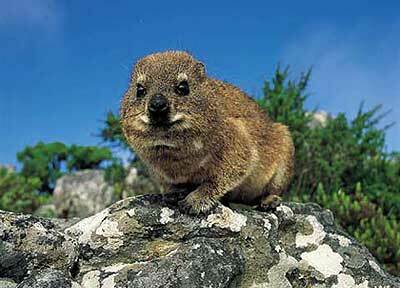 If you are lucky you may spot a water mongoose, klipspringer, or the black African eagle hunting rock dassies. More than 76 different types of bird species have been recorded and some of the most primitive beetle species in the world (Colophon spp) can still be found on the high peaks of the Poort. A visit to De Rust would be incomplete if it didn't include a stop at Tolbos Trading where Ilse Pringle takes ordinary sheets of glass and turns them into enchanting pieces of art. Also worth a visit are the unique Red Hills nature heritage site on Rietvlei Farm that consists of red colored open caves (get a permit and map at Moons Rubber Wine Estate).